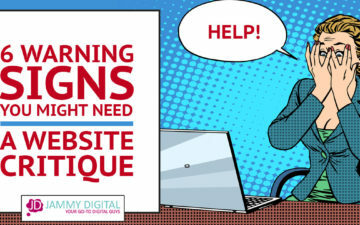 You know you need to hire a web design agency to create your new site, but you’re not sure where to start. You could work with a small agency like us, or you could hire a big agency with a fancy office. I’ll be honest; I would never class us as “cheap”. We charge between £3K–£5K for a website, which is significantly more expensive than WIX and your bog-standard local web designer. People often ask why we are more expensive. You can find out why we’re more expensive by reading this blog post. Are they cheaper because they’re not as good? Can they handle my project? How much do larger agencies charge for web design? Many of our clients have been quoted 5K-10K for a basic website and upwards of 15K-20K for a website needing additional features. Comparatively, we usually charge between 3K-5K on average. What’s the difference between us and them? 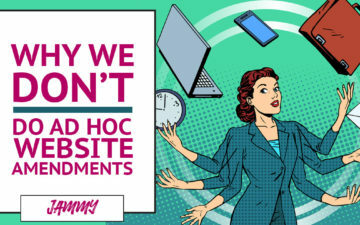 In this post, I’ll explain exactly what you will (and won’t) receive from us when it comes to getting a new website. And why I think we’re cheaper than other agencies. We make no bones about it. We love working from home. There’s no traffic for one thing, and my wife and I each have an office with all the space we require. But many website design agencies rent spaces. Depending on the agency, some of these spaces can be extra fancy, complete with cool bean bag chairs and coffee machines. After a brief search on Rightmove, renting a decent space, suitable for meeting clients, could set me back £2000 per month. That cost, along with public indemnity insurance, furniture and heating/gas costs, would need to passed onto you, the client. With the exception of the slightly higher utility bills from using the kettle 18 times a day, there’s very little extra cost from me working from home. Understandably, some people are put off by this. They like the idea of a big agency who can roll out the red carpet for them in the style of a dedicated office space. And I get it, I really do. Having a website designed is exciting, and a fancy office adds to that experience. But a lot of our clients, most of which live over 3 hours drive away, don’t really care that we work from home. They just want a good product. Which brings us nicely onto our next point…. 99% of the time, the answer to this question is no. It’s not that we don’t want to see you. We love communicating with clients. And personally, finding out about you and your business is the favourite part of my job. But we still won’t come and meet you. Instead, we communicate via video call, phone, emails and recorded videos. Why do we do only communicate online? How does this make the cost cheaper for you? It’s true, the cost of travel isn’t much. Travel from Manchester to Edinburgh for two people is £150.00 (ish). A hotel is about £100.00. The biggest issue for us is time. Say we did that two or three times a month. We could lose 4-6 days out of each month travelling and in meetings. It’s just not feasible. Time is money, unfortunately. And the more time we spend dedicated to travelling for your project, the more we’d have to charge and the longer the project would take. We’d have significantly fewer clients, which means we would have to charge a smaller pool of clients more for each project. Plus, we’ve found a whole host of benefits when communicating online compared with face-to-face. You get to see your website and the progress as we go along. There’s not just one meeting and then a brand new website, we have a few video calls throughout the process. We’ll send you training videos which will last forever. If you want to update your website at 8 pm on a Friday night and you forget how to do something, you don’t have to wait until Monday to find out! Cheaper overall costs, which are then passed onto you. Sometimes it’s easier to explain what you want face-to-face, but we find a video call is always good for that too! Especially with our screen-sharing software. Free coffee – we can’t give you a frappuccino through the computer screen, but we are hoping technology catches up soon! A lot of agencies have project managers, a sales team and administrators as well as web designers and graphic designers, etc. This varies from agency-to-agency, however, comparatively we’re very small. The obvious reason our projects are cheaper than other agencies is because we don’t pay for a team of staff. As well as the research and design, we also do all the admin, accounting (alongside an accountant), marketing and brew-making between the two of us. This means we have to carefully plan-in each project, and a single web project usually spans over two months. You speak directly to the person designing your website – Martin. There isn’t a number of people you must go through in order to talk design. It may take them less time to design a website – our websites take a minimum of two months to create (from research to launch). If you don’t like your account manager personally, you can usually request another one. We offer one service: Bespoke WordPress website design. Don’t get us wrong; this service encompasses a lot of different things. We think about the whole process your user must go through, and how best to get them to do exactly what you want them to! We don’t just design, there’s so much that goes on in the background, such as email marketing integration, online payments integration, and crafting attractive copy to increase click through rates, for example. But, we still only offer one product. Firstly, this saves you costs because we don’t have to spend time and money learning and keeping up-to-date with many different things. The second reason is that we don’t bundle in lots of services under one roof like many integrated digital agencies. We’ve had to learn this the hard way. In the beginning, we offered too many products and stretched ourselves way too thin. However, a larger agency doesn’t have this problem. So you may find that many of these items are bundled into a large package, which of course, increases the cost, but can be a good thing depending on what you need. 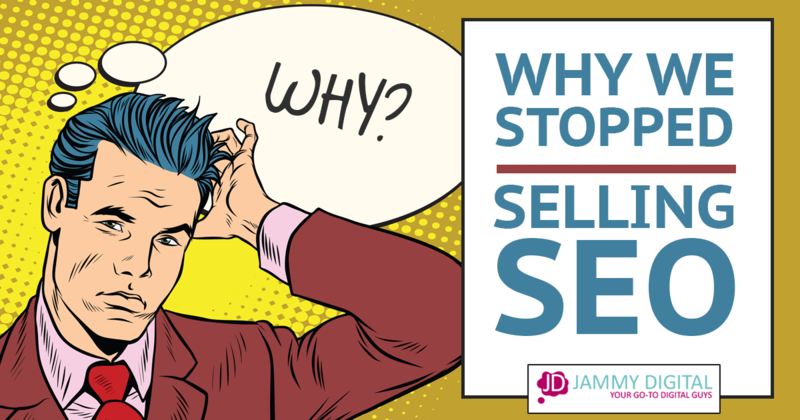 Highly in depth knowledge and skill about one particular subject – how to turn your visitors into customers using a bespoke WordPress website. There. We said it. We hate them. We don’t wear them, and we don’t expect you to pay for them. In some ways, we’re quite a low key agency. We’ve created a business that we love, and it never feels like we’re working (except when we’re filling in a tax return). We don’t have any ambitions of becoming a huge agency complete with a team of staff and a fancy office. That’s ultimately why we’re cheaper than some others out there. However, that’s not to say we’re the right agency for you. It’s not just about the cost. There are advantages and disadvantages to working with us over other agencies, and we hope we’ve made this a little clearer for you! Our aim has always been to minimise the small agency disadvantages as much as we can. 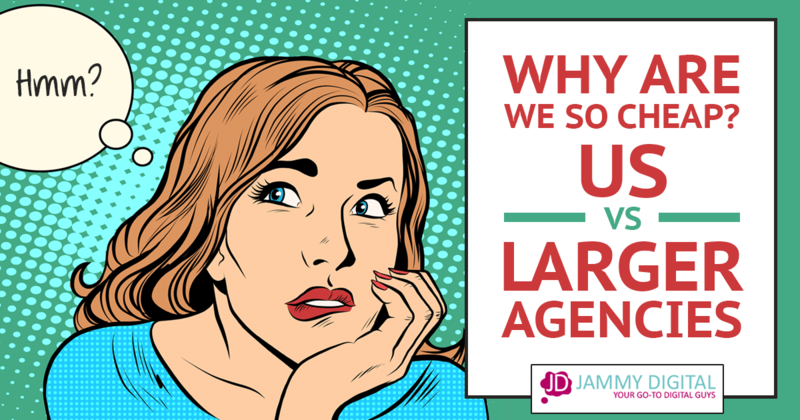 So, have you ever worked with a smaller, cheaper agency? What did you like about it? Or perhaps you prefer larger agencies with a strong presence and name? Let us know your thoughts in the comments below!